COLUMBIA, Mo. ­— Following an explosion that occurred in Schweitzer Hall on the University of Missouri campus, officials have declared the building structurally sound and safe for researchers to resume activities in other parts of the building. An investigation, which is university standard operating procedure in situations such as this, will determine if any additional actions are necessary to prevent this type of situation from occurring in the future. Four individuals, including a graduate student, a research scientist and two post-doctoral fellows, were injured in the blast and transported to University Hospital. The individual who remains in the hospital is currently listed in “good” condition by University Hospital. Following the incident, crews from MU Campus Facilities and Environmental Health and Safety assessed the damage and are cleaning the laboratories. Upon inspection, crews deemed the rest of the building structurally safe and have allowed researchers and staff access to the building to resume work. MU officials indicated that the laboratory will be completely rebuilt. Schweitzer Hall is near the intersection of College and University Avenues and houses the university’s biochemistry department. 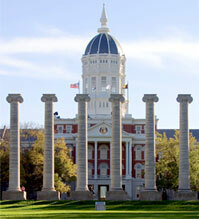 Built in 1912, Schweitzer Hall was named after Paul Schweitzer, first full-time professor of Chemistry at MU.